As letter writers, we were tickled when Stephanie told us about her New Year’s resolution. We thought her story would inspire your creativity and, for those of you with sisters or loved ones who live afar, touch your heart. We hope you enjoy this story and the inspiring year ahead! I am so lucky to have an incredibly amazing sister who just so happens to live on the other side of the world– Sydney, Australia to be exact. Several years ago (when she lived oh-so-much closer) we went through a brief phase where we would send each other wacky postcards that we found on our journeys. It was always such an unexpected surprise to go the mailbox and find a postcard mixed in with the bills, magazines and junk mail that awaited me. It’s so rare to receive a piece of handwritten mail these days and these little cards brightened my spirit. They made me laugh, they warmed my heart and they made me think of my beautiful sister and remember how dear she is to me. Late in 2010, an idea came to me that I hoped my sister would embrace. I thought it would be fun for us to do a sort of New Year’s Resolution together, but instead of giving something up, we would take on a challenge. The challenge? 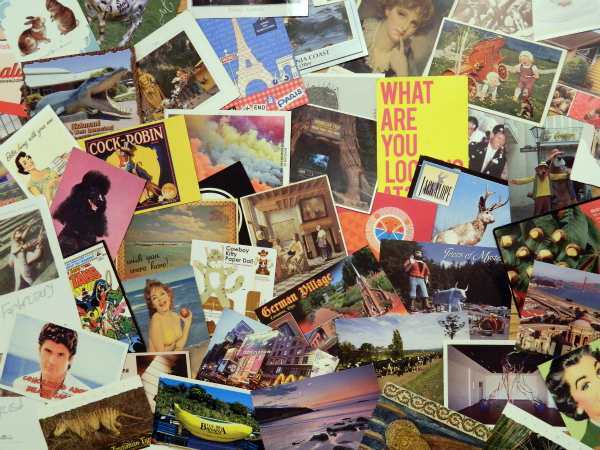 Send each other a postcard each week of 2011. Thankfully, my sister jumped right on board and, by the first week of January, a beautiful postcard of the Sydney Opera House arrived in my mailbox. Searching for postcards fitting to send is part of the adventure. Wherever I go, I now scout for postcards that either make me giggle or evoke a memory from years past. The messages written on the cards vary from week to week. We share details of recent trips (hers are admittedly more exciting than mine– I sent her a postcard about my day-trip to Minneapolis to conduct a Store Audit the same week that I received a card from her with details of her adventure in Malaysia), other times we share memories from our childhood, and stories of the crazy things that our cats– and husbands– do. Every week this year I’ve been able to find a little treasure in my mailbox, and my sister has been able to do the same. In a busy year for both of us, our ‘resolution’ has strengthened our bond and made the thousands of miles between us feel much shorter. I have saved every card that I have received this year and have them safely stored away so I can reread them whenever I start missing my sister. Fifty-two weeks later, the tradition is still going strong and we recently decided that our year of postcards will continue into the New Year, and likely beyond. My plans for this weekend include a search for another stash of cards to send her way– I may even create a few of my own! I can’t wait to see what cards I receive this year and look forward to staying connected with my sister in this very fun and special way. If you’re looking for a different sort of resolution for the New Year, grab a friend and start a postcard or letting-writing adventure of your own in 2012! Who’s in? That’s awesome! I love that idea! As a letter writer myself I thoroughly enjoyed this story of 2 sisters who sent post cards each week. My story is about my neighbor who lives 4 houses down the street. We have been friends for 40 years and even though we are close and see each other occ. we manage to write each other a letter nearly each week for this past year or more. I often mail mine as I think it is exciting to receive letters in the mail – and she often mails hers but most often her grandson hand delivers or her husband Andy pops it in my car window so I find when I retrieve the morning paper. I love this tradition that her and I have and we know it will continue into 2012. What a super idea. Sisters are the best. Wishing you a very happy new year! I love this idea! My sister used to live in China for three years, and now I’m sad we didn’t do something like this. She had quite an adventure that would have been cool to capture like this. You have inspired me to ask her anyway, or to find a willing friend, to try this! 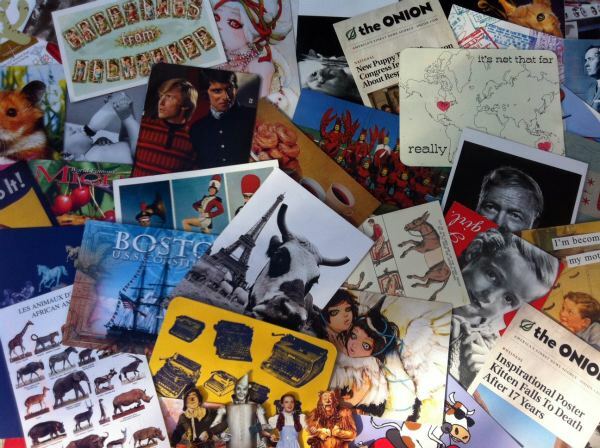 I love seeing the wonderful varieties of postcards you found for each other! and what a great way to stay in touch. Thank you! What a lovely simple way to delight, both the sender and receiver! Thank you? That’s awesome!!! I should find someone to do this with!! LOVE this idea – need to find someone to do this with before the new year……thanks for sharing! What a fabulous idea to keep in touch and share so many things…one day I’m sure you’ll create a scrap book of the cards and look forward to seeing a few pages! What a wonderful idea. I linked this to my facebook page. I see if I have any takers. This is wonderful! I do this myself with my sister. I also started a Facebook Fanpage called “Save the U.S. Postal Service by Writing More Letters.” Every little bit helps! I used to do this with my grandpa when he was in hospice only I would draw a picture of what I did that day if I couldn’t find an appropriate postcard. So even when I was just writing to say hi he knew what I was up to. My NY resolution is to write more often and this story was great inspiration! Thanks. Great idea! Maybe my New Year’s resolution will be to write more postcards? What a great idea. I own a gift and stationery store in Southern Pines, NC. I am going to do something like this with my friends and customers.Thanks for sharing!!! My MIL has been sending my son (now 13) post cards since he could read. She doesn’t send them every week, but at least once a month for the past 9 years a post card shows up for my son. I have managed to save every single one of them and they are stored in a binder somewhere. This post makes me want to go find the binder, although it might actually be in storage right now (we are living in a small set of Army quarters for 11 months while my husband attends a school, so many things were put in storage for a year). Anyway, I LOVE this idea. Absolutely love it! It makes me wish I had a sister. I have two non-letter-writing-brothers who wouldn’t participate in something like this. Sigh. This is such a phenomenal idea…a new year’s resolution I am actually excited for and think I will be able to uphold all year long!! I will be honest upfront and say I probably won’t get a postcard out every week…that might be a little much with 6 siblings…but resolving to send 1 or 2 month/per sibling is a little more achievable for me. Thank you SO much for the inspiration. Happy 2012!! It’s been such a thrill to read your comments and I’m so very excited for all the fun that awaits you this year! May 2012 bring you much love, creativity…and postcards! I love hearing this and am determined to follow your lead with my sister. A few years back i had a simple soft-bound, screw post book that i shared with a fellow mother of three. We sent it back and forth to each other month by month- filling in thoughts images, scraps of daily life at home with kids. Sometimes it was a mom to mom conversation and sometimes our kids weighed in to each other. Now 12 years later- these grown kids are still fast friends- despite living across the country from each other and the mom and i still catch up though more about us than the kids these days. I love ideas that give us a chance to connect with others by mail, on paper in an evolving momento. Thanks for reminder to do it again.